City Mapper is an amazing and very popular journey planner that provides the most efficient information on how to get from A to B while in the capital. Transport in London can sometimes be a nightmare, but with a detailed breakdown of transport options, routes and prices, the site does all the hard work for you. All that’s left down to you is choosing how quickly and at what price you want to arrive at your destination. The app has won several awards including the Best Overall Mobile App 2014 at the Mobile World Congress GSMA. The only downside is the minimal contact information in case you need assistance, and the sometimes confusing layout. If you’re walking or cycling, always take advantage of the calorie counter feature to work out exactly how many you’re burning off! 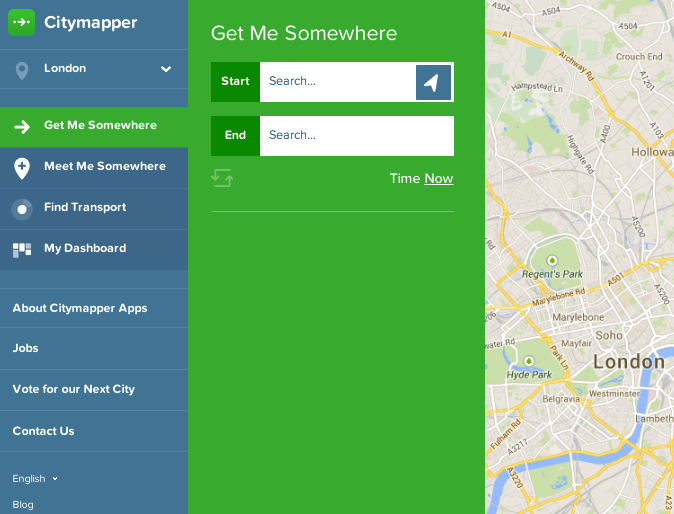 Whether you’re at home or on the go, City Mapper can help due to its capability on multiple platforms. For all you BrokeinLondoner’s who still aren’t quite sure on the quickest, easiest, or more importantly cheapest ways to get to where you’re going, the site will soon set you straight.